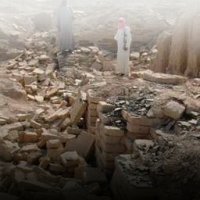 In July the Italian Ministry of Foreign Affairs and the Italian Ministry for Heritage invited a number of key note speakers, with the backing of UNESCO, to a seminar in Caserta to discuss the future of the important archaelogical sites in Libya, with an eye as to what will happen once the present situation is overcome and the country returns to a normal situation. Libya has some very oustanding arcahelogical sites, mainly of Greek and Roman origin, some of whom are without doubt the largest and most incredible such sites in the Mediterranean. It has also some very unique neolithic sites, including some outstanding rock art. It also of course has the remains of many historic towns, some in ruin and some still in use today. The meeting was entitled ‘For the Preservation of the Cultural Heritage in Libya, a Dialogue among Institutions’. Malta’s Ambassador and Permanent Delegate to UNESCO, Dr Ray Bondin, was the only Ambassador invited to the meeting both because of Malta’s importance to Libya and also because of his extensive contacts with the heritage authorities in Libya. Malta’s agreements with Libya cover also substantially collaboration on the heritage field. He had in fact last year made two missions to strengthen the collaboration with Malta. Because of his extensive experience in World Heritage he was giving his assistance on the site of Cyrenea, one of the major archaelogical sites in Libya. Representatives of the new transitory authories based in Benghazi were also present at the Caserta meeting. The meeting discussed the theft of heritage from Libya, the sites needing major attention, and in particular listened to the Libyans as to their immediate needs. Though the humane situation is the obvious priority at the moment the new Libya will most certainly invest more in tourism and therefore their archaeological sites are of the utmost importance. Ray Bondin was asked to conclude the seminar, bringing in together ideas about what needed to be done in the future. He emphasized the need for greater collaboration among the different missions and the need for more training assistance for the Libyans to take a larger part in the foreign missions, as well as the need for a re-organisation of the Department of Antiquities, something that had already been started before the uprising. A follow up meeting of a smaller group is expected to be held in a few weeks time at UNESCO HQ in Paris. Malta will continue to take a very active role in this project.